The reaction of many people to receiving a traffic ticket is to plead guilty by mail or in person at a local court, pay the fine and try to forget it ever happened. 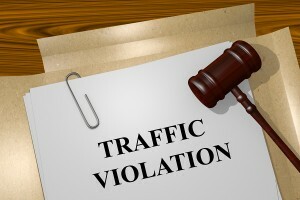 While most violations of state traffic laws are infractions with no consequences connected to them once the fines are paid, some traffic tickets are criminal records or have points connected with them. In either case, the consequences of some traffic tickets can linger long after your fine has been paid. Remember, traffic tickets are criminal records. Each state has its own traffic laws, and whether violations are traffic ticket infractions or more serious charges can vary from one state to another. In general, most traffic tickets are written as infractions. Infractions are not crimes and do not leave you with a criminal record. Common traffic infractions you might encounter around the country include the following. Reckless driving is a driving offense that some states classify as an infraction while others classify it as a misdemeanor. If you are charged with reckless driving, you should check with your state’s department of motor vehicles to find more about reckless driving charges and their effect on your driving record. Depending upon the laws where the ticket was issued for an equipment violation, you might be able to submit proof of the repairs being made to the court or municipal agency that handles traffic violations. If repairs were completed within the time specified under state or local law, the ticket could be dismissed. Traffic violations could become misdemeanors simple because of where the violation takes place. For example, a routine speeding violation is an infraction in Missouri, but there is a law in the state making it a misdemeanor to speed in a state park. The most serious violations of the laws are classified as felonies. A felony conviction could send you to prison and cost thousands of dollars in fines. As with misdemeanors, felony convictions give you a criminal record that could affect your ability to get a job. Some states allow you to remove a criminal conviction in a process known as expungement. Most states have some form of point system in place. Driving record points go on your license after a conviction. Speeding, for example, results in three points being charged against your record in New York if you were doing up to 10 mph over the speed limit. Your driver’s license can be suspended for accumulating too many points. There are procedures for removing points, but the best way to start the process is to check your driving record to find out how many points you have acquired.